Creatio President Meets Vatican Cardinal – Creatio – Adventure in Nature. Journey in the Spirit. Jose Ambrozic, President of Creatio, and also a member of CALL (Catholic Association of Latino Leaders), was part of a delegation of CALL member’s who gave the Vatican an official response to Pope Benedict XVI’s encyclical “Caritas in Veritate.” (The encyclical contains many environmental references which I have commented on previously here and here). Other members of the delegation also included Robert Aguirre, the association’s president, Archbishop Jose Gomez of Los Angeles, Fr. Matthew Munoz, a priest from Orange County in California, and Jose Gonzales, a Wall Street businessman. The response was given to Card. 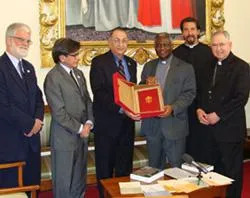 Turkson, the head of the Pontifical Council for Justice and Peace. Jose Ambrozic was also in Rome consulting the Holy See on how the next Creatio Conference can best represent the Church’s position on environmental issues. Please stay tuned for further developments of the Conference, which is scheduled for August 2012, at St. Malo Retreat Center.